Each of my kids holds a very special place in my heart! Please take a few moments and visit their individual pages and experience a little bit of the joy they each bring to my life. Click on a picture to visit each page. Maizie is 8 years old and my little heart dog. I went to Texas in April 2006 and brought Maizie home from her darling breeder Neva. Neva and I feel that Maizie was meant to be mine from the get-go. She's a spirited funny little girl who brings much joy to my life and the lives of many others. 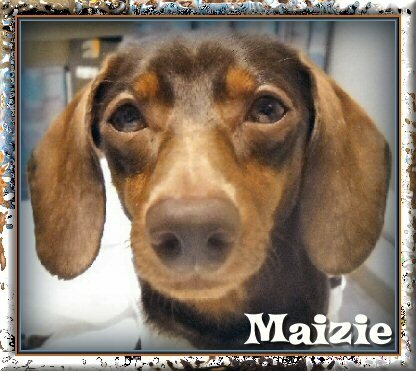 Maizie is also my Diabetic Alert dog. She came by this amazing ability naturally. I was told by Dogs 4 Diabetics that approximately 1 in 1500 dogs do this without special scent training (but that's no doubt a conservative number, as many people don't report it). Maizie is one amazing little girl, one of the elite! Georgie is my little cream puff and such a love! With the addition of this sweet little fella to the family I'm thrilled to finally see what has been a life long dream to breed and show these wonderful little hounds come to fruition. Georgie earned his Canine Good Citizen title at 9 mths old and is my first AKC Champion. 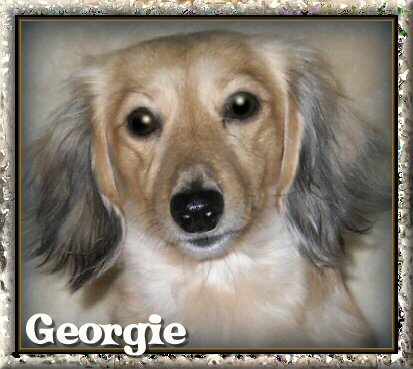 Georgie came from Wide Meadow Dachshunds. Thanks Marta & Ed! 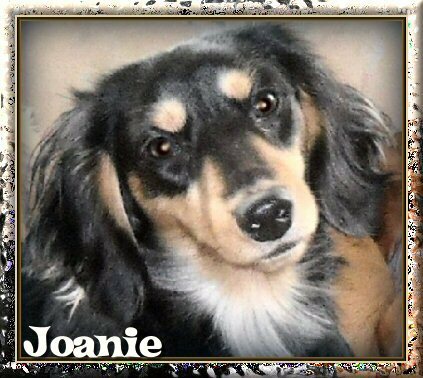 Joanie is s a sweet little black & cream mini who I've dubbed my little "fruit loop"! This darling little hound has so much energy & enthusisam! She's been a joy to have in the family! Joanie came to me from Tracy Grenda of Grendox. Thanks Tracy! 19 Man's fate is like that of the animals; the same fate awaits them both: As one dies, so dies the other. All have the same breath ; man has no advantage over the animal. Everything is meaningless. 20 All go to the same place; all come from dust, and to dust all return. 21 Who knows if the spirit of man rises upward and if the spirit of the animal goes down into the earth?" Dannie is a very special little chocolate & cream double dapple boy. Dannie is deaf, a common occurrance in double dapple Dachshunds. Thankfully his vision is perfect and look at those beautiful baby blues! Dannie and I communicate through sign language. He's an amazingly smart little guy! 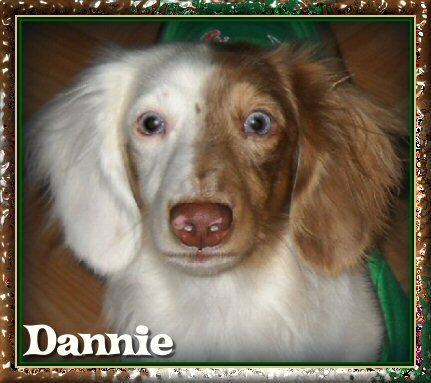 Dannie is a very special gift also from Wide Meadow Dachshunds. 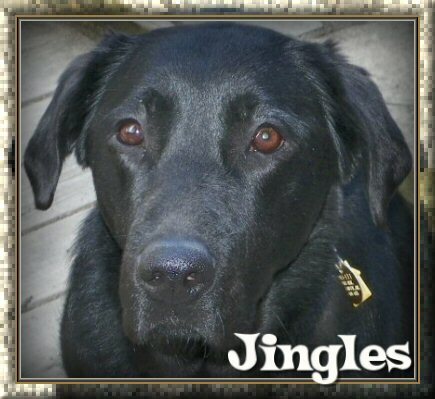 Jingles is a spirited little Lab/Golden cross with a ton of personality! She's as frisky and playful as a very young pup. Jingles is my 6th guide dog. She came into my life on April 2nd 2012 from The Seeing Eye, and we spent ten days doing home training with our wonderful instructor Rick. Jingles has proven again and again to be a superb guide and a sweet and silly-natured friend. She is a very special hero to me, and also to the nation! She was named Hero Guide Dog 2013 by the American Humane Association Hero Dog Awards!